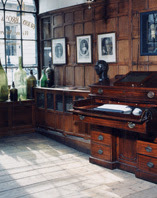 We set off immediately after breakfast and must have reached Grafton House by 1/2 past 11 -, but when we entered the Shop, the whole counter was thronged & we waited a full half an hour before we c’d be attended to. When we were served however, I was very well satisfied with my purchases. A century before Jane’s shopping expedition, London shopkeepers began to spruce up their shop fronts and displays to attract customers. 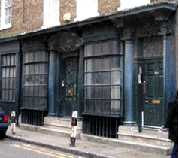 Large bow-windows, such as the silk merchant’s in the image above from Spitalfield, allowed for the entry of light as well as an attractive space for the display of goods. 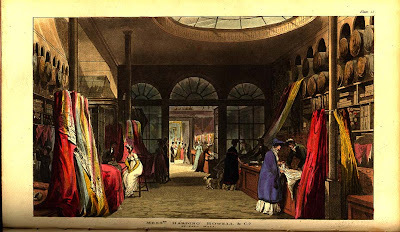 By the end of the 18th century, it was estimated that around 200 different types of shops could be found in London. Shops tended to be open for long hours, from around seven AM until seven or eight PM. These hours were perhaps one of the reasons why shopkeepers and their assistants tended to live on the premises, with a shop area in front and a parlor behind. In Holywell-street, Strand, is the last remaining shop sign in situ, being a boldly-sculptured half-moon, gilt, and exhibiting the old conventional face in the centre. Some twenty years ago it was a mercer’s shop, and the bills made out for customers were ‘adorned with a picture’ of this sign. 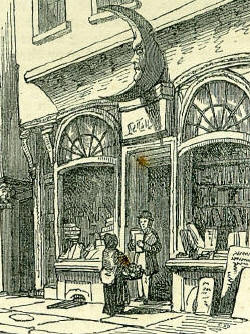 It is now a bookseller’s, and the lower part of the windows have been altered into the older form of open shop. A court beside it leads into the great thoroughfare; and the corner-post is decorated with a boldly-carved lion’s head and paws, acting as a corbel to support a still older house beside it. This street altogether is a good, and now an almost unique specimen of those which once were the usual style of London business localities, crowded, tortuous, and ill-ventilated, having shops closely and inconveniently packed, but which custom had made familiar and inoffensive to all; while the old traders, who delighted in ‘old styles,’ looked on improvements with absolute horror, as ‘a new-fashioned way’ to bankruptcy. 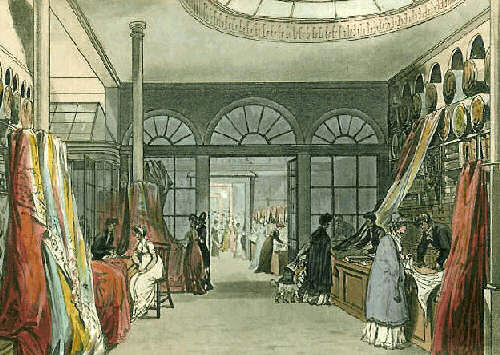 In 1800 there were 150 shops in Oxford Street alone, and Jane always made time to treat herself in the city shops and to make purchases on behalf of friends and relatives in the country. She mentions buying muslin and trimmings at Grafton’s the drapers, as well as purchases of gloves, stockings, caps, bonnets, china from Wedgwood’s shop and tea from Twinings. In Gray’s the jewelers on Sackville Street Mr. John Dashwood, encountering his half-sister, excuses himself for not calling on her, as ‘one always has so much to do on first coming to town. I am come here to bespeak Fanny a seal.’ Also in the shop is a boorish dandy choosing a toothpick case adorned with ivory, gold and pearls. In Emma, Mr Elton takes Harriet’s picture to London to be framed in Bond Street, and Frank Churchill goes there to have his hair cut — though this is only an excuse contrived to conceal his true purpose, which is to purchase a piano for the woman he loves. Jermyn Street. 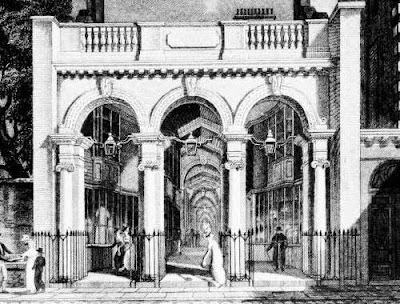 Burlington Arcade. Bond Street. Oxford Street. Saville Row. Floris. All these words conjure up images of young misses shopping with their mamas, French seamstresses, and handmade silk shirts for the Man About Town. 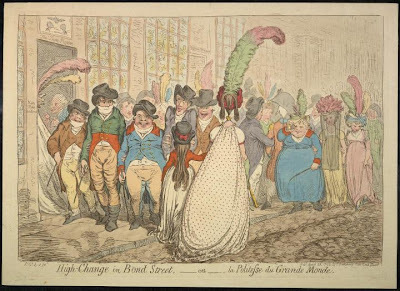 Click here to learn about Regency England shopping, and here to view Floris, where you can still shop in the original store with the bow front window at 89 Jermyn Street.